Bumblebees and Butterflies: They've arrived. I can't believe it, my Justrite Stamper kits arrived today and now I am going to play, what fun. I must say I am very impressed with Craftbox for getting the order out so quickly, I only confirmed it yesterday morning on the phone and here they are, thanks everyone. 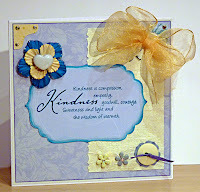 What inspiration I am getting at 'Cards by Kim', I just love her work. I am not a stamper and I very rarely colour in and Kim does, but how she puts her designs together, the distressing and embellishing and colour themes are amazing, her cards are so scrummy, go have a look http://kimpiggott.blogspot.com/ . 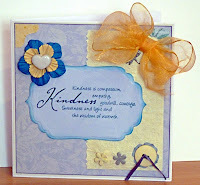 I am hoping the cards I produce will now change and improve using the influence of Kim's creativity to enhance my own. This is a very apt quote. "Get over the idea that only children should spend their time in study. and this will mean all your life." I want to continue to learn new things and for me that's about looking to see what others do, not to copy, but to adapt and apply to my own style. We'll see what happens over the coming weeks. My card today is one I finished yesterday. It is simple and provided me with an opportunity to think about how to put elements together. This is not a 'star' card but is one that has enabled me to think about how I put a design together and at the moment that seems to be taking me the most time. I do not seem to be able to see a finished creation in my head from the beginning, I start to put something together and it changes and goes through a metamorphosis, ending up to be something quite different. This one started with four circles and the quote in the middle of them, but look at it now, no circles, it has been put together in a completely different way. Even today I added more bling. Can you see the difference between the two photos from one day to the next?